SustainableWork: 25,000 pounds of local foods processed at the Wisconsin Innovation Kitchen in 3 months! 25,000 pounds of local foods processed at the Wisconsin Innovation Kitchen in 3 months! I'm fortunate to be a guest of Larry Meiller on his wonderful Wisconsin Public Radio show tomorrow, Oct. 27th from 11:45 AM to 12:30 PM. We'll be discussing the work of the Wisconsin Innovation Kitchen and the great local foods work that is flourishing in Wisconsin. Life has been rushing by as new opportunities emerge at the kitchen. Today Annette and I went through the list of foods she and her team have processed since we opened. They wouldn't be surprised but I was. 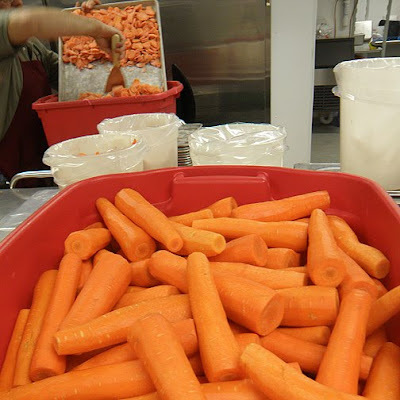 In 3 months of kitchen operations, they have processed more than 25,000 pounds of local foods. Amazing! These are local foods that in the past had either not been purchased or that came off the back of a truck from thousands of miles away. This model can work all over the world. We need to run some more experiments (or as our food preparation team would say 'you said we would do WHAT?!!') With some more of this work under our belt, we can offer this piece of the local food puzzle to others. I'm very excited by this prospect. Congratulations to Annette and her team at the Wisconsin Innovation Kitchen on their first 25,000 pounds of local foods processing!